My name is Kaitlyn, and I blog over at Pain Can Be Fun. I am still relatively new to the blogging world, but I enjoy using my blog as a break/outlet from my busy life. I teach preschool full time, I am a full time graduate student in Special Education, I looooove to run and am very passionate about healthy living 🙂 Busy, busy, busy! I want to talk a little bit today about how and why I really love to incorporate running and healthy living into an already crazy schedule. I have THREE big tips for managing a busy lifestyle while staying semi-sane. I always tell myself this. 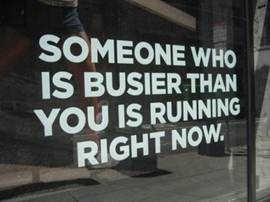 No matter how busy I am, I’m SURE there is someone much busier!! 3) I also try to pre-plan any meals and/or snacks. I always pack my own lunch for work. Otherwise, I’d be more tempted to run out and buy food that is more expensive and less healthy than if I were to pack leftovers and greek yogurt. One downside to packing lunches is that it does take more time in the evening. One little trick I’ve learned is to pre-make any lunches, when possible, on Sundays! One Sunday, we made a whole bunch of veggies burgers and froze them. I had lunch for the week all set! 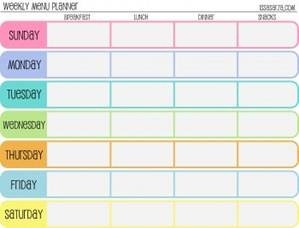 Meal planners like this one are extremely helpful. So, those are the big things I try to do throughout my weeks to stay as healthy and energized as possible! If you have any questions, comments, or suggestions you would like to pass along, feel free to head over to my blog and click on the Contact Me page! Thanks to Meg for inviting me to share her corner of the blogging world for today!